Even though cannabis concentrates have been around for a long time now, there are still some people that it’s new to. Not everyone has access to medical or recreational cannabis and concentrates can be hard (and expensive) to get if you don’t live in the right area. So since the act is fairly new to some people, there are still some terms that people aren’t familiar with that they should know if they’re going to be indulging in cannabis concentrates. Low Temp – When you heat a nail to a lower than normal temperature, the taste of the concentrate is much more flavorful than dabs at high temps. Lower temp dabs are why carb caps are so useful. Carb Cap – These can be made of ceramic, glass, titanium, or quartz. The device traps air and activates any non vaporized oil that is left on the nail. Dewaxing – The process in which you separate plant fats and the waxes. Winterizing – This is the process of using a secondary solvent to separate the fats and waxes. Alcohol is commonly used solvent for this. Rig – a simple one but still something that some people are’t familiar with. This is just the piece in which cannabis concentrates are smoked out of. They look different from the traditional water pipes. Dabber – This tool can sometimes be combined with a carb cap and is usually made out of the same materials; quartz, titanium, ceramic, or glass. A dabber has a sharp or flat end which is used to pick up cannabis concentrate and drop it on the heated nail/banger. Solventless – When making concentrates, a solvent is usually used to extract the THC from the plant matter. However, it can be done without using a solvent. This includes ice hash and rosin, making these types on concentrate highly desired and extremely flavorful, which can be seen in their price tags. 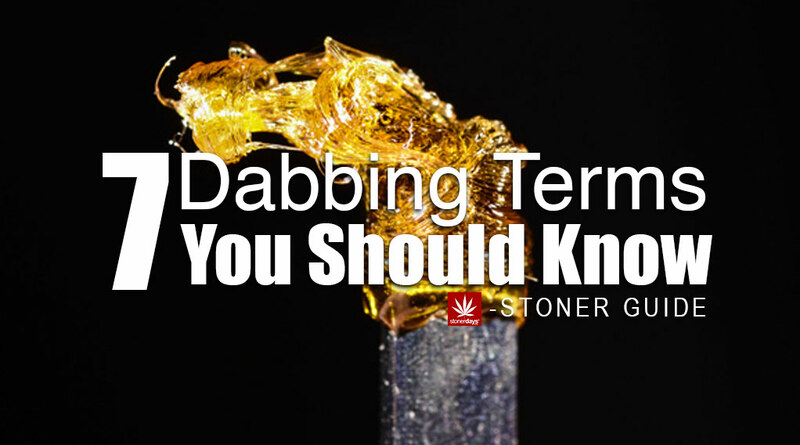 This entry was posted in Featured, Stoner Guide and tagged dabbing, terms.